On Friday we had ummed and ahhed this one through. I wasn't sure about it - Tomes renne is a 30+ degree couloir that leads up to a glacier. It is a cool access route into the Lakselvtinden area, but the weather was dubious, we were all a bit tired and motivation levels were low. Nevertheless we headed up some crappy wet snow slopes in thin birch forest onto an open basin. Big evidence of earlier avalanches also made the scene off putting and cloud was swirling continually around the tops. Lovely, Tim and I enjoyed a nice view from a house-sized boulder while the others continued a bit higher. 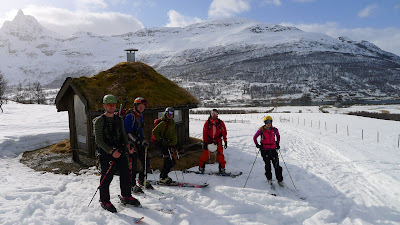 Eventually they also decided today wasn't the day for it, so we all skied down again and messed around on some little grass roofed cabins. We decided on a longer trip, feeling reinvigorated after our not so successful attempt on the couloir the day before. Clouds were drifting about the tops as we drove through Lyngsæter and the enormous santa which dominates the town shoreline. We had to drive 1.5 hours to get to the start of the mountain. 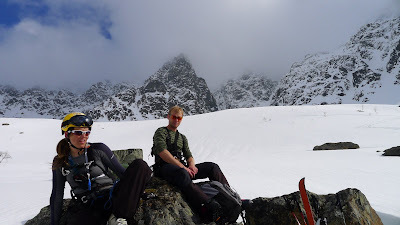 We skinned up the pretty valley which was mostly pine forest for a change, but as we climbed it turned to birch and then we came out above the tree line and sat on some moss for lunch. Spirits were a bit low because claggy stubborn looking clouds hung to the mountain sides a couple of hundred meters above us and they didn't look about to move any time soon. Hallvard was sure it would clear, the rest of us were not so sure. We continued up into an increasing white out, until we came into the 'miniamfi' described in the guidebook - at least that is where we were pretty sure we were, you couldn't see a thing. Hallvard proposed, as he had every day so far, why don't we just chill, build a kicker and have some fun....maybe the cloud will clear in a while. Unlikely, we all thought. Still, we found a wind scoop and got some great footage of Halvard, Ally and Chris on the kicker. Suddenly, after 1.5 hours waiting in the fog the clouds suddenly lifted and we could see our route to the summit up the glacier shining in the afternoon sun! Kicker instantly forgotten we took off up the glacier. Chris, Lovely and I decided to experiment with some ropeing up for the glacier travel, providing some interesting lessons. Eventually after a few mishaps we reached the top where Tim, Hallvard and Ally were and took in the awesome views all around. We skied down the big descent one at a time to be on the safe side, and it was a massive amount of turns to get back down to the mini-amphitheater again. The final part of the descent had turned into beautiful summer slush and made for some very nice skiing. Finally we made it out to the car after a rather long but very satisfying day on the mountain. Sunday was a hot day by easter Lyngen standards - about 11 degrees! We decided on the easy summit of Storgalten, with the hopes of some summit to sea skiing experiences. Climbing up was really warm and stripey polypros, shorts and t-shirts were visable all round. We met Lovely on top - he had set out earlier with a Swiss group who he was catching a ride back into Tromsø with that day. We farewelled him on the summit of Storgalten. The snow conditions had deteriorated over the last few days and nice powder had turned into wind blown crust. Ally, Tim and Halvard headed down a gully off the summit while Chris and I skied down the standard descent. Halfway down Hallvard, and then Chris with no persuasion at all, decided it was so hot that all clothes had to be removed, the only exception being essential safety item the avalanche transceiver. I skied right down to the seaside and walked back to the car along the beach. We sat out on the grass and laughed about our adventures. The smell of barbecue wafted in the air and we realised we were all quite starving, so we drove back to our Rorbu in Koppangen for our final dinner and evening. Easter Monday morning came and it was time to clean, pack up and squeeze ourselves and lots of gear in our hire car. It was raining and gray, so our more ambitious mountain plan was scraped in favour of an easy peak on the way back in to Tromsø. Chris had fun trying out Tim's telemark skis while Ally had fun trying out Chris's racing randonnee equipment. We skiied off the mountain in slushy snow and rain and made it back to the car wet and a little cold and ready to leave Tromsø and head back to the warmer more springlike climes of Trondelag.